Prague-born artist Kristof Kintera's 2007 work, Bad Innovation In The Name Of Protection, is included in his exhibition I AM NOT YOU, which just opened at the Museum Tinguely in Basel, Switzerland. 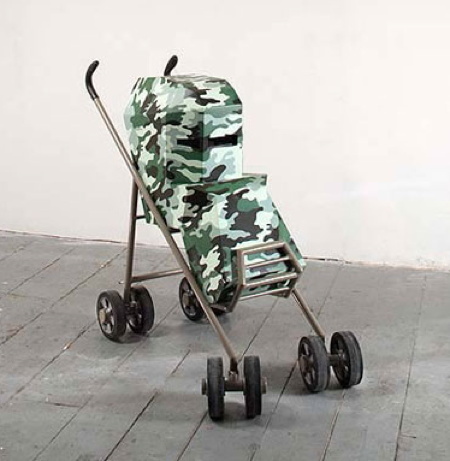 It is basically an armored stroller, made of camo-painted bulletproof glass, powdercoated steel, and [actual] stroller wheels. Also in the show, a full array of his more widely known Talkmen, preschooler-sized animatronic figures which Kintera has deployed to babble and yell about things, walk around, and, as seen here in Revolution (2005), to bash their heads against a wall. Revolution is on YouTube.